Speakers will be listed here as our programme is confirmed; please check back regularly to see which experts will be speaking at the 2019 meeting. Speakers are required to give details of potential conflicts of interest on their introductory slide. 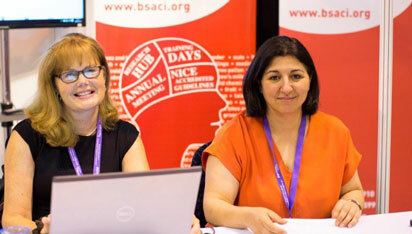 For a copy of BSACI Conflict of Interest policy click here. Mike Ardern-Jones undertook medical training at St Bartholomew's Medical College, University of London and subsequently carried out his DPhil studies at Christ Church, University of Oxford. He trained in cutaneous immunology at the Weatherall Institute of Molecular Medicine, University of Oxford via a Wellcome Research Training Fellowship. The aim of his group is to develop model systems for human inflammatory cutaneous disease which will develop the opportunity to dissect key molecular pathways and design new science based treatments. As a paradigm for such a system, atopic dermatitis is ideal and is where the main thrust of work is directed. He found an exciting novel link between the role of infection in modulating allergic responses in the skin, which suggests an important bridge between the innate immune control of adaptive immune responses and extending this work in more physiological model systems is a current principle aim. Heidi is a graduate of Leeds University and has over 20 years’ experience of working with children with food allergy. Working as a Senior Specialist Dietitian solely in paediatric allergy as part of the University Hospitals of Leicester Paediatric Allergy Service (outpatient service, specialist multiple food allergy clinics and day case food challenge programme), she has also had several publications including the Journal of the Royal Society of Medicine, Allergy, the Journal of Paediatric Allergy and Clinical Immunology and most recently work on home-based cow’s milk reintroduction in children under 3 with IgE milk allergy (Clincal Experimental Allergy). She has been a co-author of the BSACI guidelines on the Management of Cow’s Milk Allergy and presented some of her work on food challenges and safety of baked milk reintroduction at EACCI and BSACI and produced the booklet ‘Food Challenges for Children – a practical guide’. She also lectures on the Msc Allergy programme (Southampton) and has involvement in resource production for the allergy specialist interest group of the British Dietetic association. Janette Bartle is an Allergy Nurse Specialist within the ENT department at Ipswich Hospital NHS Trust. She is a BSACI Nurses in Allergy Group committee member, keen to promote best practice in allergy care particularly when it comes to the treatment of rhinitis. She is also a pollen monitor collecting air samples from the roof of the Ipswich hospital, and providing data to the Met Office to compile the national UK pollen forecast. Rebecca has worked as a Paediatric Respiratory Nurse Specialist (asthma and allergy) at Wirral University Teaching Hospital Arrowe Park since 2001. Outside of the hospital, Rebecca is Vice Chair of the National Paediatric Respiratory and Allergy Nurses Group (NPRANG) with over 260 members nationally. Regionally she is involved as Treasurer and a committee member of PRANG North West and is also involved with North West Paediatric Allergy Network (NWPAN). In education, Rebecca is a National trainer for Education for Health, and a Visiting Lecturer at the University of Chester. Rebecca is an Independent Nurse Prescriber and runs two nurse led Asthma clinics and one nurse led Allergy clinic per week in addition to weekly Consultant led Respiratory clinics and a monthly Adolescent asthma clinic. Rebecca has had many years of experience supporting children and their families with allergy, asthma and viral induced wheeze, and has published an article on the Management of Pre-school Wheeze in the GPN Journal of Practice Nursing. 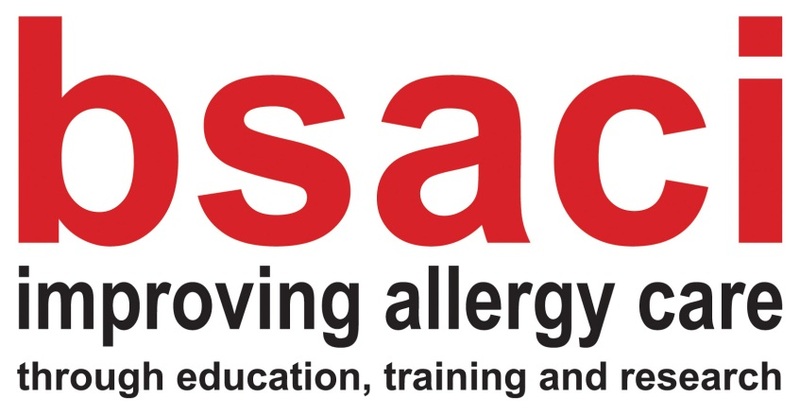 Rebecca is delighted to be involved for a second year in the BSACI workshops; this year she will be discussing the practical issues in supporting selective nut eating for nut allergic children. Dr Toby Capstick is Consultant Pharmacist - Respiratory Pharmacist at the Leeds Teaching Hospitals NHS Trust. He is a Chair of the UK Clinical Pharmacy Association Respiratory Group, and is a member of the UK Inhaler Group and the British Thoracic Society Multi-Drug Resistant Tuberculosis Clinical Advice Service. Within his job, he leads on the delivery of expert professional practice to patients requiring medicines for the management of respiratory conditions as both treatment and prevention, as well as leading the strategy on medicines optimisation for respiratory medicines, including city wide pathway development and a more integrated approach to respiratory medicine across the city of Leeds and beyond. He is an independent non-medical prescriber and runs clinics in the Leeds Interstitial Lung Disease, and Tuberculosis Clinics. He works one day a week for NHS Leeds CCG to improve respiratory medicines optimisation, addressing variation in the quality of care and prescribing in patients with asthma and COPD to improve outcomes, as well as providing training to up-skill the existing workforce in primary care, including GPs, practice nurses and pharmacists. He has published widely amongst his areas of interest including the management of tuberculosis, difficult asthma, COPD and inhaler technique. Catherine has been working in the field of Paediatric Dietetics for 19 years, starting her paediatric career at Birmingham Children’s Hospital in January 2000. Whilst there she was responsible for providing a dietetic service to a range of paediatric specialities including oncology and bone marrow transplants, renal and cardiology. A few years later Catherine relocated to Surrey to cover the Paediatric caseload in a district general hospital. The role involved providing dietetic support to general paediatric and neonatal inpatients and outpatients, children enterally fed at homes as well as children with diabetes and food allergies. For the last five years, Catherine has been responsible for providing a specialist service to the Allergy Team at Ashford and St Peter’s NHS Trust and to infants on the Neonatal Intensive Care Unit. She is actively involved in both national and trust led research and audit projects including a national product development trial and quality improvement projects within the field of Paediatric Dietetics. Catherine has also been involved in specialist lecturing at the University of Surrey, teaching Paediatric Dietetics to students, and led the coordination of Dietetic students training at Ashford and St Peter’s Hospital. Lucy Common is a clinical nurse specialist in Immunology and Allergy at Salford Royal Hospital, where she has been in post since 2010. Prior to this she was an adult nurse specialist in allergy for 3 years at Guys and St Thomas' Hospital, London. Lucy has experience in running nurse-led general allergy clinics and Immunotherapy clinics and also being involved in drug desensitisation and drug and food challenge procedures. 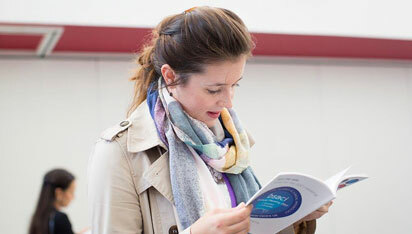 Lucy completed her MSc in Allergy at Southampton University in 2010 and has recently become a non-medical prescriber after completing the course at Salford University in August 2018. Dawn has worked in the gastroenterology service at Great Ormond Street Children’s Hospital since 2016. Part of her role has been working in the combined gastroenterology-allergy clinic. Dawn has been part of the team setting up this multidisciplinary clinic which began operating in 2018. She is interested in how to support the wellbeing of children managing difficult symptoms and health conditions. Dawn completed her Doctorate in Clinical Psychology at UCL in 2007 and has additional postgraduate qualifications in family therapy. She worked in child and adolescent mental health services in London for many years before moving to work in paediatric psychology at Great Ormond Street. Professor Paul Dimitri is the NIHR Clinical Research Network National Children’s Specialty Lead, Clinical MedTech Strategic lead for the NIHR Yorkshire & Humber Clinical Research Network, the Director of the NIHR Children & Young People MedTech Co-operative and the Clinical Director for the National Technology Innovation Transforming Child Health (TITCH) Network. Paul has led on the development and implementation of national technology networks that specifically focus on the development and adoption of technology for paediatrics and child health through private and public sector collaboration, to ensure children and young people receive the best and most advanced healthcare and to drive long-term sustainable change in the health sector. Paul currently works at Sheffield Children’s NHS Foundation Trust as a Professor of Child Health, Consultant in Paediatric Endocrinology and Director of Research & Innovation. Paul was previously the Deputy Director for the Medicines for Children’s Research Network (East) and has previously held national positions on committees at the Royal College of Paediatrics and Child Health and the Academy of the Medical Royal Colleges. Paul was awarded a PhD in Medicine by the University of Sheffield for his work in paediatric endocrinology, has received awards for his work from the RCPCH and the British Society of Paediatric Endocrinology & Diabetes and is internationally recognised in his field of research. Hannah Gould started her career in science as an undergraduate at Radcliffe College, which was then the women’s part of Harvard. She graduated in Biochemistry, and followed with an MSc at Radcliffe and PhD at Harvard with Paul Doty. The title of her PhD thesis was “The Antigenicity of Polypeptides”. It was a time when the field of protein synthesis was emerging in an exciting way, and so Hannah moved to London to work at the National Institute for Medical Research on the structure of ribosomes and translation of globin mRNA. After a further year at University College London, continuing this work, and imperial College, changing to work on chromatin structure, she settled at King's College London where she continued with chromatin studies until the breakthrough of recombinant DNA technology. Returning to her interest in immunology, she made the critical decision to clone and express the human IgE epsilon heavy chain gene cDNA. This led to research on the structure, function, and regulation of IgE and allergy, her continuing passion. Rachel is lead clinical nurse specialist for paediatric allergy at Imperial College NHS Trust with experience spanning community, primary, secondary and tertiary level allergy services. She has also been involved in the planning, implementation and evaluation of improving the recognition and access to the accurate diagnosis of allergic diseases. Oliver leads Alpha Health, a ‘Moonshot project’ established by Telefonica, based in Barcelona. Alpha Health is tackling the global rise in chronic disease by addressing the everyday behaviours that cause them at the population scale. Oliver has built an outstanding team spanning neuroscience, AI, and user-centred design, plus partnerships with some of the best universities and experts in the US, Europe, Asia, and beyond. Oliver has practiced for six years as an NHS doctor specialising in psychiatry, five years consulting in health technology with McKinsey, seven years as Abu Dhabi’s Director of Public Health, and five years leading healthtech start-ups. Oliver is US National Board Certified in Public Health (Johns Hopkins) and has contributed more than 60 academic publications and presentations in health technology, public health and behavioural science. He sits on the Commercial Board of Guy’s and St Thomas’s Hospital NHS Foundation Trust, and was awarded Freedom of the City of London in 2012. Hannah is a specialist adult allergy dietitian at Guy’s Hospital with over a decade of experience. She trained at King’s College London and has also undergone postgraduate training in FODMAPs and IBS at King’s. Her clinical practice is combined with research and she recently completed the MSc Allergy at Imperial College London. Research interests include adult peanut immunotherapy and the dietary management of eosinophilic oesophagitis. She is the PR Officer for the Food Allergy Specialist Group of the British Dietetic Association and dietetic representative on the BSACI Council. Dr Louisa James is a Lecturer in Immunology at the Blizard Institute, Barts and The London Medical School, Queen Mary University of London. She completed her PhD on the immune mechanisms of allergen immunotherapy, under the supervision of Professor Stephen Durham (National Heart & Lung Institute, Imperial College London). This was followed by post-doctoral training with Professor Hannah Gould and Professor Brian Sutton (Randall Division of Cell & Molecular Biophysics, King’s College London) studying antibody responses in patients with IgE-mediated allergy. In 2016 Louisa joined the Blizard institute, her group combines next generation sequencing of antibody genes with single-cell RNA sequencing alongside cloning & expression of antibodies to study the biology of human B cells in the context of inflammatory diseases such as allergy. Deb Marriage is the lead paediatric allergy and respiratory nurse specialist at Bristol Royal Hospital for Children, UK where she was worked since it began in 2002. She previously worked in allergy at St Mary’s Hospital, London. Deb has successfully completed the MSc in Allergy at Southampton University and a Professional Doctorate in Health at the University of Bath. Deb manages the Paediatric Allergy Service and is involved in local training programmes for GPs and practice nurses, and asthma and allergy teaching in schools and primary care. She is an advocate for nurse-led services and in promoting the extended role of nurses. She enjoys research and her particular interests are in egg and peanut allergy. "Head of Department of Pediatric Pulmonology and Allergology"
Dr Mich Lajeunesse is a consultant in Paediatric Allergy and Immunology at Southampton Children’s Hospital - part of a World Allergy Organization National Centre of Excellence at Southampton, UK. He is an Honorary Senior Lecturer at the University of Southampton and contributes to postgraduate teaching nationally, including the Allergy MSc taught programme at the University of Southampton and the Paediatric Allergy Training courses hosted by the RCPCH. Mich leads the steering committee for the BSACI registry for Immunotherapy (BRIT) which launched at the BSACI conference in 2018. Dr Makwana graduated from the University of Birmingham Medical School and completed his paediatric training within the West Midlands. His interest in allergy started whilst he was a registrar at Birmingham Heartlands Hospital. He went on to work at Alder Hey Hospital in Liverpool and gained an MD from the Department of Clinical Infection, Microbiology and Immunology at the University of Liverpool. He is currently a consultant at Sandwell and West Birmingham NHS Trust and runs the multi-disciplinary paediatric allergy service cross site. He has been highly commended for excellence in customer care and the allergy service has been voted as the most improved under his supervision. The service offers immunotherapy and specific oral tolerance induction to milk and egg. He is one of the authors of the Management of Cows Milk Protein Allergy Guideline for BSACI and co-ordinates the Midlands Paediatric Allergy Group. He is currently the Group Director for the Women and Child Health Group. He is trained as an APLS (Advanced Paediatric Life Support) course director, and trains doctors on the recognition and emergency management of children with life threatening conditions. In addition he is the MBChB Paediatric Lead for the University of Birmingham and was previously the Training Programme Director for junior paediatric training in the West Midlands. He is currently the Deputy Head of Academy (3rd Year Undergraduate Lead) and as Vice Chair of the examinations committee for the Royal College of Paediatrics and Child Health (RCPCH) he is responsible for setting both national and international examinations in paediatrics. Christine O'Keeffe is a Paediatric Allergy Clinical Nurse Specialist based at Imperial Health Care NHS trust in London. She joined the team in 2008 and became a senior Clinical nurse specialist in 2011 and is currently undertaking a MSC in advanced clinical practice. Christine has been part of the team that developed the Integrated Allergy Care Pathways for the Royal College of Paediatrics and Child Health (RCPCH). Her areas of special interest are transition of care for young people with allergic disease and also children with complex allergic disease and severe eczema. Dr Orton studied medicine in London. He took an intercalated BSc in Psychology as applied to medicine obtaining BSc (Hons). After extensive training in General Internal Medicine he decided to specialise in Dermatology where he underwent clinical training between the Royal Free Hospital and the Royal London Hospital. He completed higher training in Dermatology in 2000 (obtaining CCST) and then undertook further sub-specialist training in Contact Dermatitis and General Allergy and was awarded an MSc in Allergy in 2008. In November 2017 he resigned from the NHS after 29 years service and now works only in the private sector. His previous NHS appointments were at The Hillingdon Hospitals NHS Foundation Trust where he led the cutaneous allergy investigation unit and the General Adult Allergy service. He was concurrently Honorary Consultant Dermatologist at the Royal Free Hospitals NHS Trust where he ran the cutaneous allergy investigation unit. Dr Orton is past President of the British Society of Cutaneous Allergy and past Secretary of the European Society of Contact Dermatitis. Kathryn is the Allergy Nurse Specialist at Broomfield Hospital in Chelmsford. Having qualified from Nottingham University she developed her career in allergy and asthma at St Mary’s Hospital in London. Since moving to Broomfield Hospital she has established nurse led allergy and asthma services including new-patient clinics, in-patient reviews, day case food and drug challenge sessions and supports the long established immunotherapy and biologic service. Enthusiastic about the role of allergy nurses she is the Chair of the BSACI Nurses in Allergy Committee and represents the profession on the Royal College of Physician’s Allergy Accreditation (IQAS) Steering Group. Imke Reese works as a nutritionist specialising in adverse food reactions in a private practice in Munich, Germany. After studying Nutrition at the Christian-Albrechts-University in Kiel, Germany she worked in the Department of Dermatology, Venereology and Allergology at the Charité University Hospital, Berlin where she also achieved her PhD. Apart from nutrition counselling, she runs lectures/ seminars and regularly writes for scientific journals. She is an active member of the Food Allergy Task Force of the German Society of Allergology and Clinical Immunology (DGAKI) and is involved in writing all guidelines issued by the task force. She is a member of both the scientific advisory boards of DGAKI and DAAB, the most important German patient organisations. As an EAACI member, she is involved in the Allied Health IG and part of the task force on Nutrition and Immunomodulation. She participates in INDANA (International Network for Diet and Nutrition in Allergy) and the German DAAB network of dieticians and nutritionists working in the field of adverse food reactions. Moreover she is active in a German working group on Dietetic Issues in Allergology (ak-dida) and editor of several textbooks in this field. Graham Roberts qualified in Medicine from the University of Oxford. He completed a 4 year clinical research fellowship in paediatric allergy and respiratory medicine at Imperial College School of Medicine at St Mary’s in Professor Gideon Lack’s group. He was awarded an MSc in Epidemiology from the London School of Hygiene and Tropical Medicine and completed his doctoral thesis on the safety and efficacy of immunotherapy for childhood allergic asthma. He then completed his training in paediatric respiratory medicine at The London Hospital and the Royal Brompton Hospital. Graham Roberts took up an appointment as a clinical senior lecturer in paediatric allergy and respiratory medicine in October 2004; he was promoted to Reader in 2007 and to Professor in 2011. He is also the Co- Director of the David Hide Asthma and Allergy Research Centre on the Isle of Wight. He has been a member of the Executive Committee of the European Academy of Allergy and Clinical Immunology (2011-7) and was Chair of the Paediatric Section (2011-3). Professor Roberts has a translational epidemiological research programme. It focuses on the pathogenesis and natural history of childhood asthma and food allergy together with the development of new strategies to improve the management of these clinical problems. Dr. Hugh A. Sampson is the Kurt Hirschhorn Professor of Pediatrics at the Icahn School of Medicine in New York and has over 35 years’ experience in translational research focusing on food allergic disorders and basic immunologic mechanisms responsible for these disorders. His research has been funded continuously by grants from the NIH, including the Principal Investigator for the Consortium for Food Allergy Research until 2018. He has published over 480 articles, 88 book chapters and co-edited 7 books, primarily on clinical and immunopathogenic aspects of food allergic disorders. Dr. Sampson was elected to membership in the National Academy of Medicine of the National Academies in 2003 for his research accomplishments. Dr. Sampson has trained over 40 post-doctoral fellows, many of whom are now leaders in the field of food allergy, and is a past-president of the AAAAI and past member of the WAO Board of Directors. He has served on the Editorial Boards of 5 allergy journals and is an Associate Editor of Pediatric Allergy & Immunology. In November 2015, Dr. Sampson stepped-down as Dean for Translational Biomedical Sciences at Mount Sinai to become a part-time employee of DBV Technologies as their Chief Scientific Officer. Dr Scadding trained at Cambridge University & the Middlesex Hospital, with an MA and MD at the University of Cambridge. In 1995 Dr Scadding was made a Fellow of the Royal College of Physicians. She is also an Honorary Member of the Allergy Society of South Africa and an Honorary Member of the ENT Society of South Africa. Dr Scadding has been awarded the Polish Rhinological Society Award, the BSACI William Frankland medal for outstanding services to UK Clinical Allergy, Allergist of the Year- Allergy UK, the Clemens von Pirquet award for research from European Academy of Allergy and Immunology, the Walter Jobson Horne award of British Medical Association and the World Allergy Organization -Outstanding Clinician. 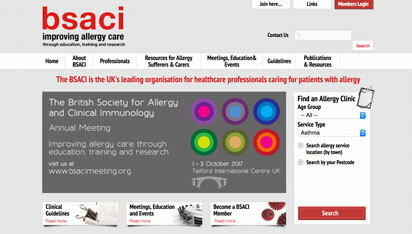 She was Secretary of the British Society for Allergy and Clinical Immunology (BSACI) 2007-9 and President 2009-12. Research interests include rhinitis and its co-morbidities, including rhinosinusitis; aspirin hypersensitivity and sublingual immunotherapy and is the author of over 300 peer- reviewed publications. Charlotte completed a master’s degree in Nutrition at Kings College London and went on to qualify as a dietitian from London Metropolitan University in 2006. Her first dietetic posts were at Poole and Bournemouth hospitals where she worked with adult inpatients. She went on to work at St Mary’s Hospital on the Isle of Wight where she developed an interest in food allergy and research while working with both adults and children at the David Hide Asthma and Allergy Research Centre. In 2009 she joined the paediatric allergy team at St Thomas’ Hospital where she has since worked as both a clinical dietitian and research dietitian on the LEAP and EAT studies. Over this time the department has expanded and she is now the senior research dietitian responsible for providing a specialist dietetic service to multiple paediatric allergy research studies conducted at the Evelina Children’s Hospital at St Thomas’ Hospital (e.g. LEAP, EAT and BAT (Basophil Activation Test) follow-on studies, Pronuts study, and various AImmune peanut immunotherapy trials). She has been Treasurer of the Food Allergy Group of the British Dietetic Association and is a member of INDANA, EACCI and BSACI. Paul Turner is MRC Clinician Scientist and Clinical Senior Lecturer in Paediatric Allergy & Immunology within the MRC & Asthma UK Centre in Allergic Mechanisms at Imperial College London, and Clinical Associate Professor at the University of Sydney, Australia. His research centres on the pathophysiology of severe allergic reactions to food, and how this impacts upon allergen risk management. Paul is a member of the Science Council for the Food Standards Agency, and an Honorary Consultant to Public Health England. He leads the food allergy desensitisation programme at St Mary's Hospital, London; the team was awarded the Best UK Clinical Team by Allergy UK in 2018. Dr Rachel Ward has more than 25 years’ experience in international strategy and standards for the food chain, covering emerging issues, contaminants and residues, food allergens, labelling and claims to ensure effective consumer risk protection and robust regulatory compliance. Rachel has BSc (Hons) in Applied Biochemistry, a PhD from Nottingham University in in vitro skin toxicology models, and a wide experience in regulatory affairs and quality assurance. She was the lead risk manager for PepsiCo Europe on food, promotional toys, and novel ingredients, and since becoming an independent consultant 7 years ago has worked on various food and food supplements regulatory and QA projects for SME, larger manufacturers and UK retailers. Rachel has a strong interest in food allergen risk management and regularly provides training to industry. Dr Wilkinson did his medical training in Cambridge and has gradually gravitated up north with job opportunities ever since. He currently lives outside Harrogate but travels in to Leeds to work. He has a longstanding interest in cutaneous allergy and managed to attach himself to the patch test clinic for all 6 years of his dermatology training but did no photodermatology – a situation that he wouldn’t have got away with today. He has been an executive committee member of the British Society for Cutaneous Allergy (BSCA) and the European Society for Contact Dermatitis; he chairs the British Association of Dermatologists/BSCA group setting minimum standards for cutaneous allergy services; he has contributed to European guidelines for patch and photo patch testing and to UK and EU standards of care for occupational dermatitis. Dr Wilkinson has extensive experience of patch testing children and published a review of changing patterns of contact allergy based on 1000 tested children over a 20-year period.